My little men and me! : SPRING BREAK 09 CONT. These two pics, above and below, he was feeling much better as you can tell from his smile...plus he had just woken up from a nap! The first part of their spring break was spent camping but cut short due MO getting sick with fever and sore throat. We took him to the doctor Tuesday, he was given 2 shots and sent home on antibiotics, they said he had tonsillitis, the strep test was neg. Wednesday he was not better at all and still running high fever so we took him back to the doctor. They did a mono test on him and then decided it was an abscessed right tonsil that was not responding to the antibiotics which is pretty typical and in which case the abscess would have to be drained which he would have had to be put to sleep to do. Our pediatrician called like 3 or 4 ENT's and ALL were on vacation. They finally sent us over to the Children's Medical Center ER because there was an ENT there. Well they ended up hooking him up to an IV to get antibiotics to him fast in an effort to start fighting the infection and get his fever from spiking like it had been. After reading MO's CT Scan the ENT wanted him admitted, he was going to need a lot of antibiotics pretty quickly on top of steroids to start hopefully fighting the infection he had. 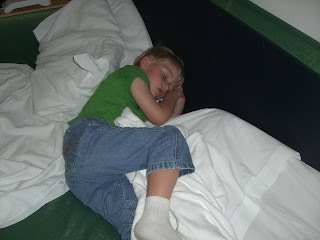 He was still burning up with fever Wednesday night. 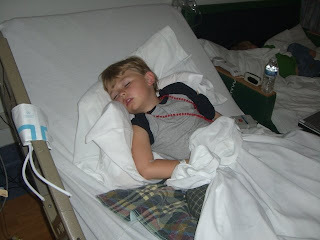 They were able to get his fever down but he still ran it throughout the night. Finally Thursday it broke and he didn't run any more fever which was a sign that the antibiotics were starting to do their job. The doctor wanted to keep us one more night to get more antibiotics and steroids in him through his IV. Today he has been great! It looks like everything is working as it should and he has not ran anymore fever. 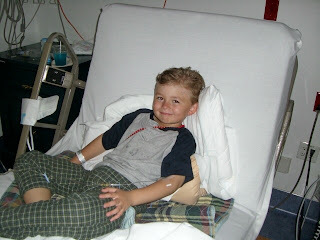 His right tonsil is still a little sore when he eats certain things but for the most part he is much better. The biggest problem now is the upset stomach that all the meds are causing, which should be interesting when he has to go back to school Monday. We were released today at about 230 and sent home with two antibiotics and something for his stomach. He will be on these three meds for two more weeks at three times a day for each. 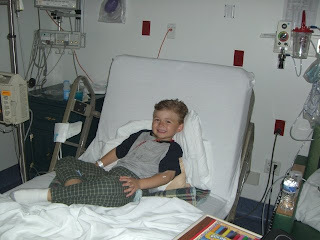 I have to follow up with our pediatrician and the ENT that treated him Monday morning. We will be getting MO's tonsils out this summer for sure! I just hope between now and then he can stay healthy! MO gets strep it seems like once a month and of course has never had what he has now so the next 3 mos will be touch and go I am sure. I just don't see him being able to go that long and not get sick with his throat but I sure hope he can! When we took the meds to get filled the pharmacist was concerned about one of the antibiotics that they prescribed for MO. She said it is a very strong ADULT antibiotic and she just wants to be sure the dosage is correct that was down for someone MO's age and weight. These two antibiotics are the same two he has been on the last two days in the hospital. The particular one in question the pharmacist said would be for aggressively treating something which they are doing and after explaining to the pharmacist the last two days she could see why they would be using this antibiotic but she still wants to make sure the dosage is correct. So she has a call into our pediatrician and to the hospital doctor. She said we could go ahead and give MO his first couple doses and by then she hopes to be back with us with more info. But I am sure what was prescribed is correct but its nice to know that the pharmacist catches things like this! And this particular med we are talking about tastes really bad and the doctor said depending on MO's weight she might be able to give it to us in a capsule and then be able to take the beads out of the capsule and sprinkle it over food for MO to take which I am so thankful she was able to do! MO is terrible at taking ANY med, even Motrin and Tylenol, so a med like this that really taste bad I am not sure we would have even been able to get MO to keep it down. We are talking about the same kid that throws up when taking Motrin or Tylenol! And the same kid that WHEN he does keep med down its because with each tiny sip of med he chases it with a gallon of water and an M&M! So we are finally ALL home! Daddy spent the night with MO while I was home with MS and my mom and sister had MC. And me and MS would go to the hospital each morning about 8 so that daddy could go to work. I hate this is how MO's spring break was spent but I would have much rather it been like this than him going back to school and then being out a whole other week due to being sick! I will be having to send a note to his teacher about his frequent bathroom trips though! The doc said that we have taken a lot of bacteria out of him, GOOD and bad so we needed to work on putting the good back in him. So we have stocked up on yogurt! I don't even really like yogurt but can force my self to eat the key lime and lemon flavors and even MS will eat this so I am pretty sure MO can eat at least one yogurt a day, which we can also sprinkle in the one antibiotic and the med that is suppose to help with his tummy! Thanks for any and all prayers and would love for them to continue that he can stay healthy or at least not end up back in the hospital until we can get his tonsils out!